Bankruptcy is a federal court process that can help consumers eliminate overwhelming debts or establish a plan to repay them. Depending on your income and circumstances, bankruptcy laws may give you a way to erase many financial obligations and start afresh. But bankruptcy may also have a long-term negative impact on your ability to obtain credit, find a job, get insurance or rent a place to live. Individuals may be able to file one of two kinds of bankruptcy: Chapter 7 "liquidation" bankruptcy or Chapter 13 "repayment" bankruptcy. Chapter 13, sometimes referred to as "wage earner" bankruptcy, may be your only choice if the court determines you have the income to repay at least a good portion of your debts. Filing Chapter 13 bankruptcy allows you to pay your debts in installments over an agreed-upon time period, usually three to five years. After the repayment period is completed, any remaining unsecured debt (excluding certain income taxes, past due spousal and child support, and legal bills resulting from your bankruptcy filing) will be discharged. The court must approve your plan to repay all or part of the money you owe. Many people who want to keep property, such as a house or car, turn to Chapter 13. Today, all bankruptcy filers are subject to a "means test" to determine whether they are eligible to file Chapter 7 or if they must file Chapter 13. You may be prevented from filing Chapter 7 if your income is above your state’s median income and you can afford to make a certain portion of your unsecured debt payments. Median incomes vary from state to state. For example, the median income for a family of two in New Mexico in 2017 was $57,704, while in New Jersey it was $75,305. You can find state median income statistics for individuals and families on the U.S. Trustee website. Use the pull-down menu to select the most recent income chart. The court also can require you to file Chapter 13 if it believes that you are abusing the system by filing Chapter 7. You still might be able to file Chapter 7 even if your income exceeds the state median, as long as it is not enough to pay your current living expenses and meet the repayment requirements of Chapter 13. The Internal Revenue Service’s (IRS) Allowable Living Expense National Standards are used as the guideline for determining allowable household expenses for food, housekeeping supplies, clothing, personal care and some miscellaneous items, and to determine how much money you have left over each month to repay your debts. You cannot file bankruptcy until you provide proof that you have participated in pre-bankruptcy credit counseling within the six months before you file. Before your bankruptcy case can be closed (discharged), you must complete mandatory post-bankruptcy money management training. You must pay the fees for these courses, and the services must be provided by an agency certified by the U.S. Trustee. Visit the U.S. Trustee website for a list of agencies in your area. Approved credit counselors must provide the services free of charge to consumers who cannot afford the fees. Bankruptcy is a personal decision. Most people file bankruptcy because of crushing debt, often caused by financial hardships such as unemployment, lack of adequate insurance, catastrophic medical expenses, marital problems, overextended credit or, more rarely, out-of-control spending. Bankruptcy laws were passed in order to give people a fresh start, and to give debt-burdened consumers an organized, systematic way of paying back creditors. If you’re over your head in debt and you can’t see being able to repay all the money you owe, you might be interested in filing bankruptcy. Or, if you can pay back creditors but need to get out from under wage garnishments or repossession threats, you may want to consider bankruptcy. Find ways to earn more money. Ask your entire household to contribute from their earnings. Keep a budget. Track not only what you spend, but also upcoming expenses and regular bills you must pay. Downsize your lifestyle. If your mortgage or new car loan is killing you, think about selling your home or car and living more simply for a while. Stop using credit. Though it might not be as convenient, pay for daily expenses as you go (with cash or a debit card) rather than using a credit card. Shop carefully. Compare prices on everything you buy, and consider buying generic brands or in bulk. Start saving. Even low-income households can save regularly to build an emergency fund to fall back on when times get tough. When considering bankruptcy, it’s important to know that certain debts cannot be erased. If you want to avoid foreclosure on your home or repossession of your car, you must bring your accounts up-to-date and continue paying your obligations. By federal and state law, certain things you own outright (assets) are protected during bankruptcy. These are called "exempt" assets because they do not need to be sold during the bankruptcy process. Everything else you own of value (all your non-exempt assets) must be sold and the proceeds used to pay your creditors during a Chapter 7 bankruptcy filing. Assets such as your home or auto that serve as collateral for a loan can be sold if proceeds from the sale would be enough to cover the amount of your exemption, the outstanding loan balance and any expenses related to the sale and still enable some funds to go to other creditors. Your exempt assets may include all or part of the value of your home that you own outright (your home equity). Other assets that you might keep despite filing bankruptcy are retirement accounts, autos, clothing, household furnishings, books and tools of your trade. Your creditors cannot demand that exempt assets that you own outright be sold to pay your debts. Any part of your home you own outright—your home equity—is protected to varying degrees by federal and state law. State provisions that protect your home (homestead exemptions) are subject to your having owned the property in that state for at least 40 months prior to the bankruptcy. If that’s not the case, then federal law limits your homestead exemption to $160,375 regardless of state rules. Your homestead exemption is also capped at $160,375 regardless of the state allowance if you have committed bankruptcy fraud, violated securities laws or been found guilty of certain other types of crimes. Learn about your particular state’s homestead exemption limits and rules at Nolo.com. Many people who file bankruptcy don’t realize what an impact it will have on their lives. It can affect your credit history for seven to 10 years, so you might have trouble getting new credit, a mortgage, a job, insurance or a rental home. Some credit issuers might extend credit regardless of a bankruptcy, while others will extend credit only after several years or after the bankruptcy is no longer on your credit report. If bad spending habits have led you to bankruptcy, legal forgiveness of your debts might not change the way you handle money and credit. If you do not learn money management skills, you could fall into debt again, probably without the option of declaring bankruptcy. If you file Chapter 7 bankruptcy, you can’t file Chapter 7 again for eight years. If you’ve already filed Chapter 13, you can’t file Chapter 13 again for two years. If your first bankruptcy was a Chapter 13, you can’t file Chapter 7 for six years (with some exceptions). If your first bankruptcy was a Chapter 7, you can’t file Chapter 13 for four years. Bankruptcy is a complex legal process—you go to court and hand over control of your financial affairs to strangers. Even if you file Chapter 7, the bankruptcy judge will determine if you actually have enough income to repay at least part of your debts under a Chapter 13 filing and are abusing the system by filing Chapter 7. Are you considering bankruptcy because creditors are harassing you? Federal and state fair debt collection laws may be able to help you protect yourself from abuse and harassment by debt collectors. Understand your rights by reading Consumer Action’s Debtors’ Rights, The Fair Debt Collection Practices Act and When a Collector Calls publications. Review your credit history. The three largest credit reporting companies are Equifax, Experian and TransUnion. Once per year, you are entitled to a free credit report from each agency through AnnualCreditReport.com, a service run by the three agencies, with oversight by the Federal Trade Commission. Order your free reports online, by phone (877-322-8228) or by mail (you must first download an order form from the website, then send it to Annual Credit Report Request Service, P.O. Box 105283, Atlanta, GA 30348-5283). The reports will list most, if not all, of your debts. If you find inaccuracies in your report, follow the instructions that come with the report to file a dispute. The law requires that the credit reporting agency verify the information with the company that furnished it and remove inaccurate information from your credit report. Speak with your creditors. Discuss your situation and explain that you are willing to pay off your debts. You may be able to arrange a payment plan or negotiate a reduced settlement amount. Ask each creditor to agree to a voluntary plan for the repayment of your debts. See if they will reduce any interest or penalties that you owe. If you reduce your other expenses, it may be possible to pay off your debts in a reasonable time. Consider credit counseling. If your creditors will not work with you directly, there are many reputable credit counseling organizations offering credit education, credit report review, budgeting assistance and debt management plans. To find a credit counseling organization, contact the National Foundation for Credit Counseling (NFCC) online or by phone (800-388-2227). Many NFCC-affiliated credit counseling agencies (often known as "Consumer Credit Counseling Service," or CCCS) offer free counseling and charge debt management plan (DMP) fees on a sliding scale based on your income. If you participate in a DMP, your counselor will contact your creditors on your behalf. Sometimes creditors will waive interest charges and late fees when you enroll in an established debt management plan. Deal only with qualified credit counseling agencies—walk away from any offers that claim you can wipe out your debts. Seek out loans or tap your home equity. Explore the possibility of loans from family members or friends who might be willing to lend you funds if you repay them on a fixed schedule with a fair interest rate. If you are a homeowner, consider refinancing, taking out a second mortgage, or getting a home equity line of credit in order to pay off your debts. Be careful, though—if you miss payments on your home loans, the lender can force you out and sell your property. Many companies prey on consumers looking to solve their money troubles. Be alert for companies offering an easy way out of debt—they may be for-profit counseling agencies (even if they say they are non-profit) or companies that promote bankruptcy as a quick and easy fix. Especially avoid any ads offering "debt consolidation mortgages." Investigate any company or agency before talking to a representative, and don’t sign any agreement or pay any money until you are confident that it is the right thing to do. It is possible to file a bankruptcy case pro se (without the assistance of an attorney), but according to the U.S. Bankruptcy Court, it is extremely difficult to do it successfully. Although the law requires bankruptcy attorneys to tell you that a lawyer is not required to file bankruptcy, professional advice can help protect your rights in this complicated legal proceeding. Your creditors almost certainly will have attorneys representing them. At the very least, consult with an attorney before making the decision to file on your own. Ask friends and family if they can recommend a lawyer. If not, the National Association of Consumer Bankruptcy Attorneys has an online directory of its members. On the home page, click on "Find An Attorney." Look for a lawyer with expertise and more than a few years’ prior experience in personal bankruptcy. In many cases, lawyers don’t charge for a brief initial consultation, but to be safe, ask about fees before making an appointment. Bankruptcy attorneys must disclose all fees and can take your case only after you have signed a written contract. When you are billed, always ask for an explanation of charges you don’t understand. Bankruptcy lawyers can be held accountable, and may be subject to fines, if your filing contains any false information, so they must check the accuracy of the information you provide. In some cases, bankruptcy attorneys require clients to pay the cost of title searches and credit reports needed to verify information that will be contained in the filing. If you can’t afford to pay a bankruptcy attorney, you may be able to find free or low-cost legal services. Call your local or state bar association or county courthouse, or check the Yellow Pages under "Legal Aid" or "Legal Assistance." You can also visit the Legal Services Corporation website and use the "Find Legal Aid" state directory. You must file bankruptcy in the U.S. Bankruptcy Court Division nearest to where you live. If you have internet access, you can find the appropriate court by using the Federal Courts Finder. You can buy the forms you need at the bankruptcy clerk’s office or download them for free from the internet. The filing fee for Chapter 7 bankruptcy is $335; it’s $310 for Chapter 13. The court will need proof you have completed mandatory credit counseling, as well as past tax returns and pay stubs. You will have to provide information about your debts, creditors, income sources, loans, real estate, personal property and living expenses. The documents you might need include payment demands, mortgages, deeds, summonses, court judgments, credit card statements, medical bills, bank account statements, child support or alimony agreements, student loan statements and documentation of any past bankruptcy. If you hire a bankruptcy attorney to represent you, he or she will know what you need and how to pull it together. Filing bankruptcy will stop—or "stay"—collection efforts by your creditors for the duration of the bankruptcy case. If your creditors continue to contact you, they could be cited for contempt of court and ordered to pay damages. However, if you miss any requirements after filing, your creditors can petition to have the stay lifted. If the court determines that there have been frequent bad faith or abusive filings, the stay will be voided and collectors will be able to seek payment from you. A trustee will be appointed to review your forms and documents. You may be able to keep your home, car or other possessions that the court determines are necessities, but if you owe money on these assets, you must continue to make payments. In some cases, you may be able to pay less on a secured debt than the full outstanding balance. Whether such debts can be reduced depends on a variety of factors, such as whether you are filing a Chapter 7 or 13 and the type and value of the property. 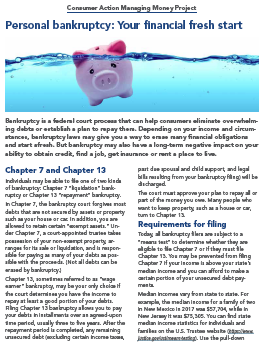 To learn more about bankruptcy law provisions that can help reduce the amount you have to pay on secured debts, talk to a bankruptcy attorney or read Nolo’s "Secured Debts in Chapter 13 Bankruptcy" and "Secured Debts in Chapter 7 Bankruptcy: An Overview." In a straightforward Chapter 7 case, you typically will be notified about the final outcome of your case within three to six months and, in most cases, debts that qualify will be discharged at that time. Chapter 13 debts are discharged when the repayment plan is completed—usually in three to five years. Discharge does not mean your debts are forgiven, canceled or extinguished. It means that your creditors can no longer force you to pay the debt, but they still have the right to reclaim property in which they have a security interest. Can my landlord kick me out? Bankruptcy cannot prevent or halt eviction if you fail to pay your rent after filing bankruptcy. Will I go to jail? No. There is no debtors’ prison in the U.S. Does my spouse have to file? In most cases, no. However, your spouse will be obligated to continue paying the full amount of any joint obligations you have, even if your responsibility for paying them is discharged by bankruptcy. What will happen if I list a co-signed debt in my bankruptcy filing? Your responsibility to pay will be removed, but the co-signer(s) will be held responsible for the entire debt. If the co-signed debt is not delinquent, you may be able to "reaffirm" it as part of your bankruptcy filing. This means that, with permission from the trustee, you waive any right to protection from the creditor if you default on the debt in the future. Do I have to give back my credit cards? This depends on the companies you do business with. If you reaffirm your liability for the debt during the bankruptcy filing, you may be able to keep the cards. However, the credit card companies can close your accounts if they wish to do so. Filing bankruptcy will negatively affect your credit history. You may find it difficult to get a new credit card. However, you might be able to obtain a secured credit card when your bankruptcy is final. Even people with damaged credit may be able to obtain a secured credit card, which requires you to deposit money in a savings account that can be used by the creditor if you fail to repay your card balance. Your line of credit on a secured card usually is the same as the amount of money you deposit. Some credit card companies offer new credit cards to people who recently filed bankruptcy because they know that people who have filed bankruptcy cannot file again for several years. These offers are likely to be for credit cards with very poor terms, such as high interest rates and penalty fees. Be very careful about responding to such offers. Click on "Get the Law" or "Legal Encyclopedia" to find information on many legal topics, including bankruptcy. Visit the website of this publisher of legal background guides for consumers on many topics, including debt, collections and bankruptcy. Click on "Find Your Attorney" for a directory of member attorneys. Call or visit the website to find a credit counseling agency that provides the services you need, including bankruptcy counseling and education. If you need pre-bankruptcy credit counseling, you can also find a certified agency on the U.S. Trustee site (listed below). Find agencies certified to provide pre-bankruptcy credit counseling and post-bankruptcy money management education, as well as guidelines for bankruptcy means testing. Consumer Action’s Managing Money Project funded revisions to this guide.